308 pages | 11 B/W Illus. Following the recent global financial crisis there is a growing interest in alternative finance – and microfinance in particular – as new instruments for providing financial services in a socially responsible way or as an alternative to traditional banking. Nonetheless, correspondingly there is also a lack of clarity about how to regulate alternative financial methods particularly in light of the financial crisis’ lessons on regulatory failure and shadow banking’s risks. 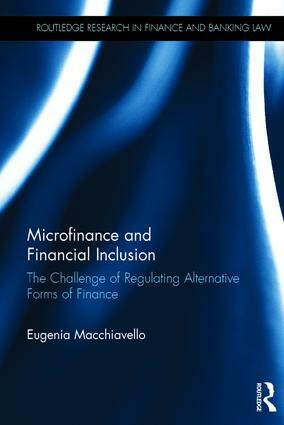 This book considers microfinance from a legal and regulatory perspective. Microfinance is the provision of a wide range of financial services, particularly credit but also remittances, savings, to low-income people or financially excluded people. It combines a business structure with social inspiration, often resorts to technological innovations to lower costs (Fintech: e.g. crowdfunding and mobile banking) and merges with traditional local experiences (e.g. financial cooperatives and Islamic finance), this further complicating the regulatory picture. The book describes some of the unique dimensions of microfinance and the difficulties that this can cause for regulators, through a comparative analysis of selected European Union (EU) countries’ regimes. The focus is in fact on the EU legal framework, with some references to certain developing world experiences where relevant. The book assesses the impact and validity of current financial regulation principles and rules, in light of the most recent developments and trends in financial regulation in the wake of the financial crisis and compares microfinance with traditional banking. The book puts forward policy recommendations for regulators and policy makers to help address the challenges and opportunities offered by microfinance. Eugenia Macchiavello is a Lecturer/Adjunct Professor in Banking Law at the University of Genoa and Senior Research Fellow at the Genoa Centre for Law and Finance.